دشت لوت در جنوب شرقی کرمان و یکی از بیابان‌های بزرگ جهان می‌باشد که از گرم‌ترین نقاط دنیا است. دانه‌سنجی رسوبات می‌تواند نشان دهنده ویژگی‌های فرایند‌های پیشین و مورفولوژی اشکال ناهمواری باشد. کلوت‌های دشت لوت دارای مورفولوژی بسیار جالب توجه و منحصر به فردی در ایران و جهان می‌باشند که شناخت ارتباط بین خصوصیات دانه سنجی آنها با شکل ناهمواری آن که مجموعه‌ای از تپه‌های مورب و یا رشته‌های کم و بیش موازی هستند می‌تواند اطلاعات مفیدی را نشان دهد. در این مطالعه دو نمونه یاردانگ یا کلوت از دشت لوت در شمال شرق شهر شهداد در شمال کلوت‌ها انتخاب و تعدادی نمونه رسوب از ارتفاع‌های مختلف آن مطابق با اصول نمونه‌برداری برداشت شد. نمونه‌های رسوب در آزمایشگاه با روش پیپت مورد اندازه گیری قرار گرفت. این روش اولین بار توسط نویسندگان در دانشکده جغرافیا طراحی و انجام شده است. در نمونه یاردانگ‌های مورد مطالعه مشخص شد که فرسایش آبی و بادی جزء فرایندهای غالب تشکیل دهنده اشکال یاردانگ‌های شمال دشت لوت می‌باشد. در این تحقیق آزمایش کلسیمتری، تعیین رنگ رسوبات انجام و پارامترهای آماری نظیر میانگین دانه ها، انحراف معیار، کورتوسیس و اسکیونس داده‌ها نیز محاسبه شده است، طبق نتایج حاصل از دانه سنجی و پارامترهای مربوط به آن نتیجه گرفته می‌شود که یاردانگ‌های بخش شمالی دشت لوت در تمامی ارتفاع این شکل ناهمواری عمدتاً دارای رسوبات گلی می‌باشد، همچنین نتایج میزان بیشتر رسوبات سیلتی را در ارتفاع‌های بالاتر این دو یاردانگ نشان داده است. این تحقیق نشان می‌دهد که مورفولوژی تخم مرغی یاردانگ‌های مورد مطالعه در ارتباط با رسوبات سیلتی بخش بالایی و رسوبات رسی بخش پایینی این اشکال ناهمواری می‌باشد. لازم به ذکر است که این مقاله از یک طرح تحقیقاتی گرفته شده و با حمایت مالی دانشکده جغرافیا- دانشگاه تهران به انجام رسیده است. The Lut Desert is in the southeast of Kerman province and one of the largest deserts of the world, which is one of the world’s driest and hottest places.Granulometric analysis of sediments can indicate the characteristics of the old formative processes and the morphology of landforms. Yardangs (Kaluts) ofthe Lutplain have a very interesting and unique morphology in Iran and in the world, and recognizing the relationship between their granulometric characteristics and their rough and uneven shape, which is a set of diagonal hills or more or less parallel strands, can provide useful information. In this study, two samples of yardang or kalutfrom the Lut plain in the northeast of Shahdadcity located in north of Kaluts were selected and a number of sediment samples from different heights were taken in accordance with sampling principles. The sediment samples were measured in laboratory using pipette method. 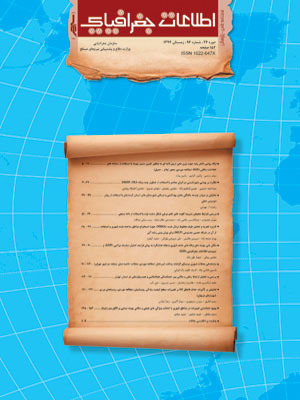 This method was first designed and implemented by the authors at the Faculty of Geography in Tehran University. In these two Yardang samples, it was found that water and wind erosion are among the dominant processes forming the Yardang shapes of the North of the Lut plain. In this research,calcimetry test, determination of sediment color was performed, and statistical parameters such as the mean of grains, standard deviation (SD), kurtosis and skewness of data were also calculated. According to the results derived from the granulometry and its related parameters, it can be concluded that the Yardangs of the northern part of the Lut plain at all altitudes of this form of roughness contain mainly muddy deposits. The results have also showna higher amount of silty sediments at higher altitudes of these two Yardangs. This research indicates that, the studied morphology of ovoid yardangs is in relation with the upper part’ssilty sediments and the lower part’s clayey sediments of these forms of roughness. It should be noted that, this article was taken from a research project which was completed through financial support of the Faculty of Geography-University of Tehran. 1- احمدی، حسن (1374). ژئومورفولوژی کاربردی، جلد اول، فرسایش، چاپ سوم، انتشارات دانشگاه تهران. 714 صفحه. 2- خدابخش و صحرارو؛ سعید و ناهید (1392). آزمایش‌های رسوب شناسی، چاپ اول، انتشارات دانشگاه بوعلی سینا. 184صفحه. 3- داگلاس دبلیو، لوویس (1384). رسوب شناسی تحلیلی، مترجم: امینی، عبدالحسین و زمان زاده، سید محمد، چاپ اول، نشر دانشگاهی، 254 صفحه. 4- علایی طالقانی، محمود (1384). ژئومورفولوژی ایران، چاپ ششم، نشر قومس، 360 صفحه. 5- علوی‌پناه، سید کاظم (1383). بررسی منابع آب و رطوبت سطح الارض کلوت‌های بیابان لوت با استفاده از داده‌های ماهواره‌ای؛ پژوهش‌های جغرافیایی، شماره 47، صص 69-57. 6- فیض نیا، سادات (1387). رسوب شناسی کاربردی با تأکید بر فرسایش خاک و تولید رسوب، چاپ اول، نشر دانشگاه گرگان، 368 صفحه. 7- محمودی، فرج الله (1378). ژئومورفولوژی اقلیمی؛ چاپ دوم، انتشارات پیام نور، 178 صفحه. 8- مشهدی، علوی پناه و احمدی؛ ناصر، سیدکاظم و حسن (1381). مطالعه ژئومورفولوژی یاردانگ‌های لوت. مجله بیابان جلد 7، شماره 2، 25-43. 9- معتمد، احمد، (1390). زمین‌شناسی عمومی. چاپ هشتم، انتشارات دانشگاه تهران. 480 صفحه. 10- معتمد، احمد (1353)، مسائل زمین‌شناسی چاله لوت، دانشگاه تهران، مؤسسه جغرافیا. گزارش‌های جغرافیائی، 11: طرح پژوهشی لوت. 11- مقصودی، مهران، حاجی زاده، عبدالحسین، نظام محله، محمد علی، بیاتی صداقت، زینب (1392). برآورد تقریبی مساحت، حجم و جرم و فشار کلوت‌های دشت لوت با استفاده از مولتی دیتا. اولین گردهمایی انجمن کواترنری ایران، دانشکده جغرافیا دانشگاه تهران، 29- 30 آبان ماه. 12- مقیمی، ابراهیم، (1392). ژئومورفولوژی ایران. چاپ دوم، انتشارات دانشگاه تهران. 333صفحه. 13- موسوی حرمی، رضا، (1380). رسوب‌شناسی. چاپ هفتم، انتشارات استان قدس رضوی. 474 صفحه. 15- Amir Houshang Ehsani , Friedrich Quiel , (2008), Application of Self Organizing Map and SRTM data to characterize yardangs in the Lut desert, Iran, Remote Sensing of Environment 112 (2008) 3284-3294. 16- Besler, H. (2008). The great sand sea in Egypt. Amsterdam, The Netherlands: Elsevier. 17- Dong, Ping Lv, Junfeng Lu , Zhibao, Guangqiang Qian, Zhengcai Zhang, Wanyin Luo(. (2012),. Geomorphology and origin of Yardangs in the Kumtagh Desert, Northwest China, Geomorphology 139-140, 145-154. 18- Ehsani, A. H., & Quiel, F. (2008). Application of Self Organizing Map and SRTM data to characterize yardangs in the Lut desert, Iran. Remote Sensing of Environment 112 , 3284–3294. 20- G. Sauermann, P. Rognon, A. Poliakov, H.J. Herrmann,(2000).The shape of the barchan dunes of Southern Morocco, Geomorphology 36, 47-62. 21- Krinsley, Daniel B. (1970), A Geomorphological and paleoclimateological Study of the playas of Iran, Geological Department of Interior Washington. 22- Krisztina Sebe, Gábor Csillag, Zsóﬁa Ruszkiczay-Rüdiger, László Fodor, Edit Thamó-Bozsó, Pál Müller, Régis Braucher, (2011) Wind erosion under cold climate: A Pleistocene periglacial mega-yardang system in Central Europe (Western Pannonian Basin, Hungary), Geomorphology, 134, 470-482. 23- Kwan-Nang Pang, Sun-Lin Chung, Mohammad Hossein Zarrinkoub, Seyyed Saeid Mohammadi, Hsiao-Ming Yang, Chiu-Hong Chu, Hao-Yang Lee, Ching-Hua Lo, (2012).Age, geochemical characteristics and petrogenesis of Late Cenozoic intraplate alkali basalts in the Lut–Sistan region, eastern Iran, Chemical Geology 306-307, 40-53. 24- Laura Lewis, Peter Ditchﬁeld, J.N. Pal, Michael Petraglia, (2012), Grain size distribution analysis of sediments containing Younger Toba tephra from Ghoghara, Middle Son valley, India, Quaternary International, 1-11. 25- Ling Yuquan, Liu Shaozhong, Wu Zheng, Li Changzhi,(1998). simulatingstudy on barchan dune, chinese geographical science, Science Press 8, 2, 168 - 175 . 26- M. Gutierrez-Elorza, G. Desir, F. Gutierrez-Santolalla ,(2002), Yardangs in the semiarid central sector of the Ebro Depression (NE Spain), Geomorphology 44 , 155-170. 27- M. Mohajjel , (2009), Thin-skinned deformation near Shahdad, southeast Iran Journal of Asian Earth Sciences 36, 146-155. 28- Mohajjel, M. (2009). Thin-skinned deformation near Shahdad, southeast Iran. Journal of Asian Earth Sciences 36 , 146-155. 29- Richard Thomas Walker, Morteza Talebian, Sohei Saiffori, Robert Alastair Sloan, Ali Rasheedi, Natasha MacBean, Abbas Ghassemi, (2010).Active faulting, earthquakes, and restraining bend development near Kerman city in southeastern Iran, Journal of Structural Geology 32 ,1046e1060. 30- Simon J.Blott and Kenneth pye, (2001), A Grain size distribution and statistics package for the analysis of unconsolidated sediments, Earth surface process Landforms 26, 1237-1248. 31- Tucker, M. E.,(1988). Techniques in sedimentology. Blackwells, Oxford,394, pp. 32- Zhibao Dong, , Ping Lv, Junfeng Lu, Guangqiang Qian, Zhengcai Zhang, Wanyin Luo,(2012). Geomorphology and origin of Yardangs in the Kumtagh Desert, Northwest China, Geomorphology 139-140, 145-154. 33- Bobek, H., (1959), Features and Formation of the Great Kawir and Massileh, University of Tehran Press.